Developer: Brownie Brown, Square Enix Co., Ltd. The Mana Tree Needs Defenders! The location of the Mana Tree–wellspring of all life–has long been lost to legend. Many centuries of passed, and the Granz Realm's Dark Lord is searching for the secrets of the ancient tree so that he can control the source of Mana. Now, a young hero and heroine must come together to defeat the evil that threatens both the mystical tree and the world itself. Choose your hero! Guide a battle-headened gladiator on his quest to avenge the deaths of his parents! …or guide a young girl, one of the last survivors of the Mana Clan, as she confronts the past that haunts her. 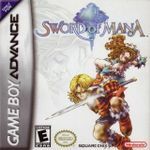 Experience the saga of these two heroes as their stories weave together and they join forces to protect the Mana Tree from the powers of darkness.